This is part of an ongoing series of posts in a collaborative effort between the Practicum: Critical Theory, Religion, and Pedagogy and the Bulletin for the Study of Religion blogs. 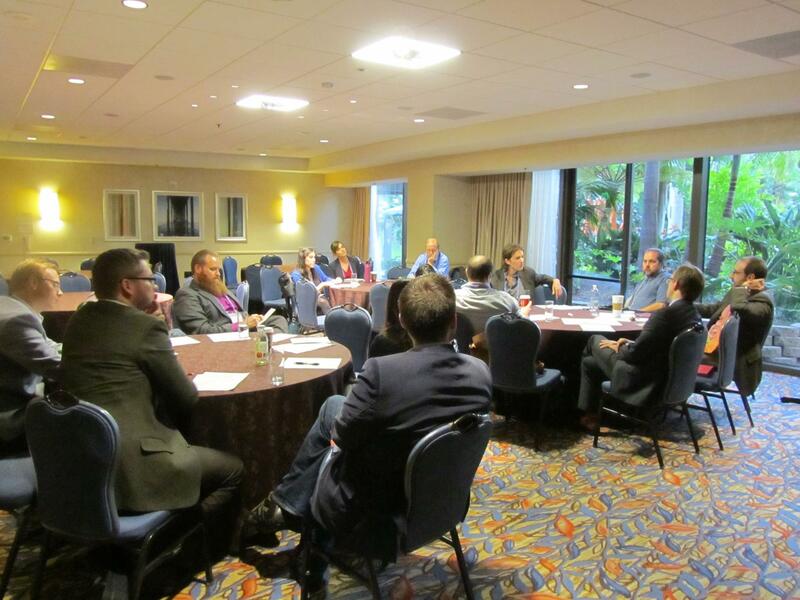 On November 23, 2014, approximately 20 scholars of religion, from grad students to more seasoned professors, participated in a NAASR workshop in San Diego, CA on the question of how to introduce theory in an introductory religious studies class. Participants were divided into three groups addressing: 1) who/which theorists to include; 2) what data should be included, and; 3) where should theory come into play (e.g., at the start, middle, or end?). What follows are reflections from two of the participants. For previous posts, see here, here and here. “What is it you want people to stop taking for granted?” I don’t remember who said this at NAASR’s San Diego gathering on theory in the classroom, but it’s the standout line in my notes, and the point that gives me the best angle for reflecting on my theoretical choices in preparing my Introduction to the Study of Religion class next fall. Although we appeared to reach an agreement on the importance of going straight for the category of religion and for the power-effects of authorizing particular forms as “religious,” I want to take another direction in the fall of 2015. In my particular location, the direct critique of the category doesn’t seem to play well, and I wonder if it will be more effective to take “religion” apart from a more oblique angle? Beginning the semester with “religion” as a piece of (relatively) solid ground for students to work from, I hope to short-circuit some related intuitions and perhaps, at the end, try to say something about the category itself. In retrospect – and this amounts to a post-hoc rationalization on my part – the intuitions I want to shake up are that: (1) “religion” is reducible to a single psychological function, or doesn’t encompass the full range of intelligent, interested human behavior; (2) “religions” (and other social groups) are defined by centralized, empowered beliefs and rituals, and; (3) “religion” is separable from the “secular” and the “modern.” To that end, I’m pairing Freud’s Future of An Illusion, Durkheim’s Elementary Forms, and Weber’s Protestant Ethic with ethnographic studies that complement and complicate their central claims. At a faculty mentor’s suggestion, I‘m also having students investigate further layers of complexity by going out to report on local religious groups, using Michel de Certeau’s writings on practice as a theoretical framework. We will follow Freud with Brian Malley and Tanya Luhrmann’s cognitive ethnographies of evangelical Christians. Ann Grodzins Gold and Gloria Raheja’s study of sexual politics in rural Rajasthan will help complicate Elementary Forms’ top-down, center-out picture of ritually constructed communities. After some selections from Weber, we will turn to Joanne Punzo Waghorne’s studies of religion in urban South Asian spaces, and Courtney Bender’s ethnography of “metaphysical” spirituality subsisting across medical, scientific, artistic, therapeutic, commercial and traditional “religious” sites in Cambridge, Massachusetts. Given my recent experience of opening my fall course with J.Z. Smith’s critique of the category, I may decide to end my next class with it instead. In hindsight, the essay “Religion, Religions, Religious” seems a bit heavy for the first or second week, even in an upper-division course like the one I taught this semester. I am continuously enlightened (and entertained) by Smith’s work, but it’s still difficult reading for me, and I have a B.A., an M.A., and an MPhil in religious studies. This is not to criticize Smith, or the intrepid students who stuck out my first solo teaching venture with me. It is only to argue that his essays are professional-grade tools that even aspiring professionals sometimes struggle to use with precision. Assigning his denser work to undergraduates right out of the gate feels almost unfair. If I do include the critique of the category, it will be in the last week or two instead of the first, and it will definitely begin with the preface to Imagining Religion. This concise piece was received better in the fall, at least, though I don’t think its central point really sunk in (again, this certainly is not my students’ fault). I wager that it will stick a lot better once we’ve spent twelve or thirteen weeks shaking up the category from other angles. Ian Cuthbertson told the group about broaching the critique of the category in the middle of his year-long course. I’m in agreement with Ian that this move works as a particular kind of dramatic gesture, and it’s a gesture I would enjoy closing on. What does everyone else think? Will it be easier to trouble “religion” after we’ve studied how “it” is conscious and unconscious, a conduit for power and for resistance, modern, non modern, anti-capitalist and flamboyantly capitalist all at once? Will the dissonance between “religion is almost anything” and “religion really isn’t a thing” make the last gesture more poignant and memorable, or will it just make it confusing? This entry was posted in Pedagogy, Religion and Theory, Theory and Method, Uncategorized and tagged Ann Grodzins Gold, Brian Malley, Courtney Bender, Dan Moseson, Emile Durkheim, Gloria Raheja, J.Z. Smith, Joanne Punzo Waghorne, Max Weber, Michel de Certeau, NAASR, Sigmund Freud, Tanya Luhrmann. Bookmark the permalink.